For two hundred million years they did their own thing. Then we came along. Dr Sue Cartsairs runs a small turtle trauma center in Ontario. Often the turtles have been run over by vehicles and it is the job of her center to try and even the odds for survival for the turtles in this day and age. In other words, to fix and release them. As Dr Carstairs points out many of these turtles are over a hundred years old and as such deserve the chance to get back to the water and continue living their long, long lives. As well as a great insight in to practical not to mention pragmatic conservation, Fix and Release (by Scott Dobson) is visually very beautiful. 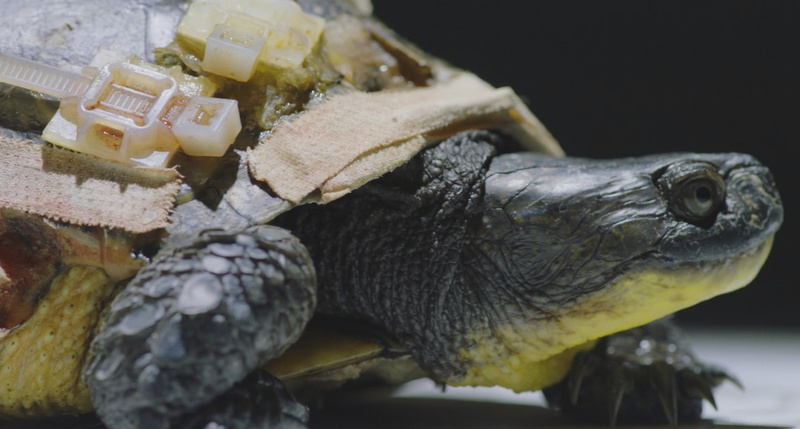 For me the most amazing part of the film was seeing the eggs being taken out of a turtle which had not survived its injuries. Once extracted the eggs were placed very carefully in a box and then left to incubate and hatch. Then they are released in to the wild (turtles are born independent). Amazing. If you would like to find out more about how to help Ontario’s fresh turtles then click here.